NIWA photographers are well known for their stunning images of New Zealand’s environment. Four of the best discuss their favourite shots and what was going on at the time. 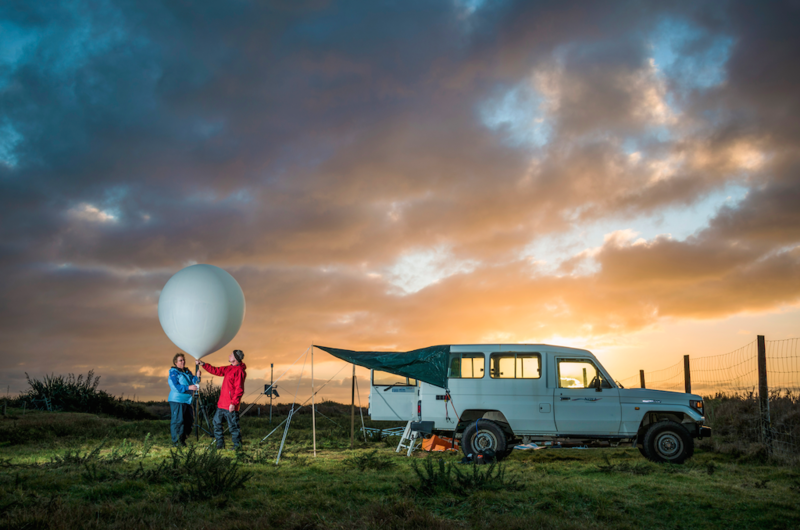 The photo of scientists Tony Bromley and Sally Gray releasing a weather balloon was taken at the tiny West Coast settlement of Hannah’s Clearing, south of Haast in mid-winter. 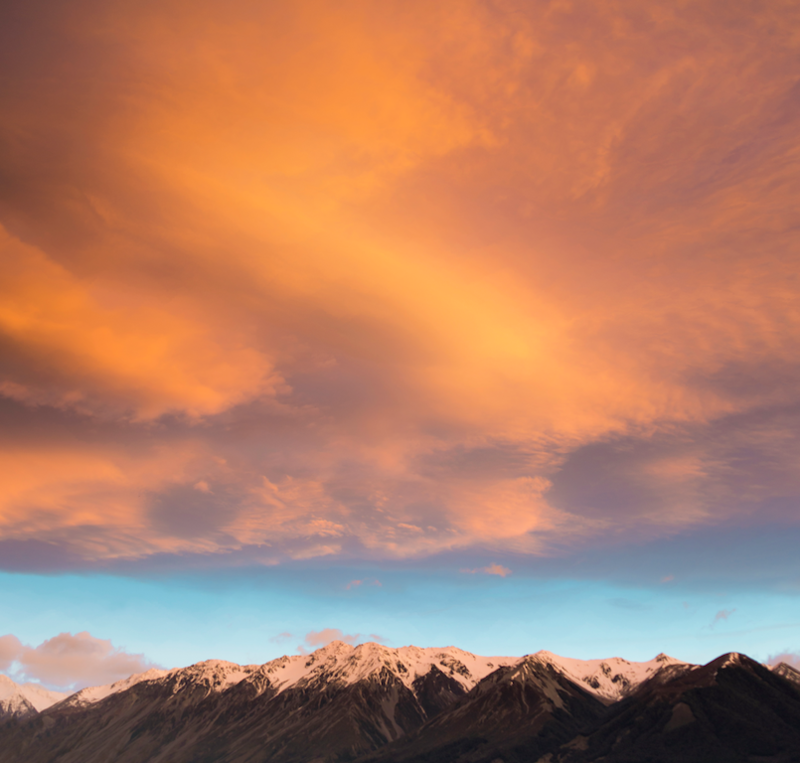 Tony and Sally were working outdoors at night, night after night, in pretty extreme conditions playing a crucial part of an international experiment looking at gravity waves in the Southern Alps. The shot was taken at sunset, I had a couple of lights set up but in the end used a standard speed light flash with a diffuser. 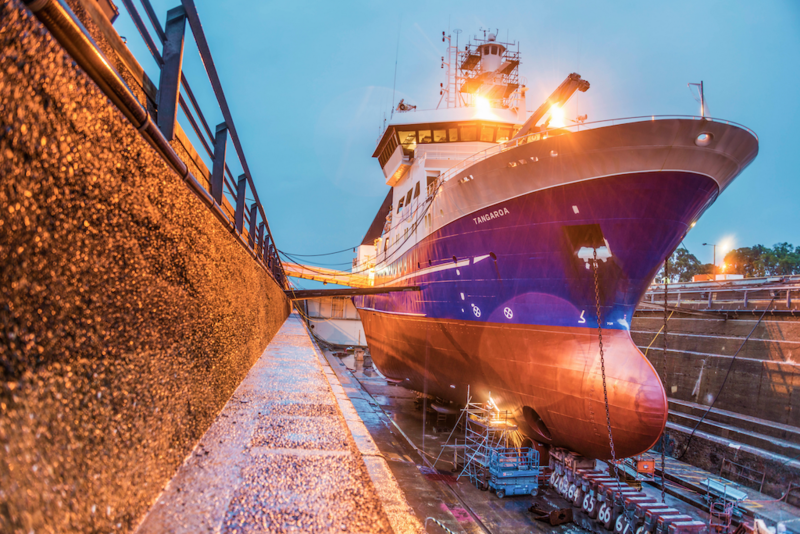 I missed my flight home for this shot of NIWA’s research vessel Tangaroa in dry dock in Auckland. It had been raining off and on all day, and was still drizzling when I was leaving. By then the floodlights were on and it was getting dark so I set up a tripod and used a long exposure to capture the rosy glow. This sunrise in the Rakaia Gorge was spectacular but it took a bit of effort to get. I got up at 3.30am, drove for two hours, parked by the side of the road and then walked for 2km inland. Fortunately the weather gods dished up a pretty decent sunrise but it was only like that for about a minute or two so I had to make the most of it. Crispin Middleton, specialist diver. Camera: Nikon D7000. Both these images were taken using a Tokina 10-17mm lens. I use an Aquatica underwater housing. 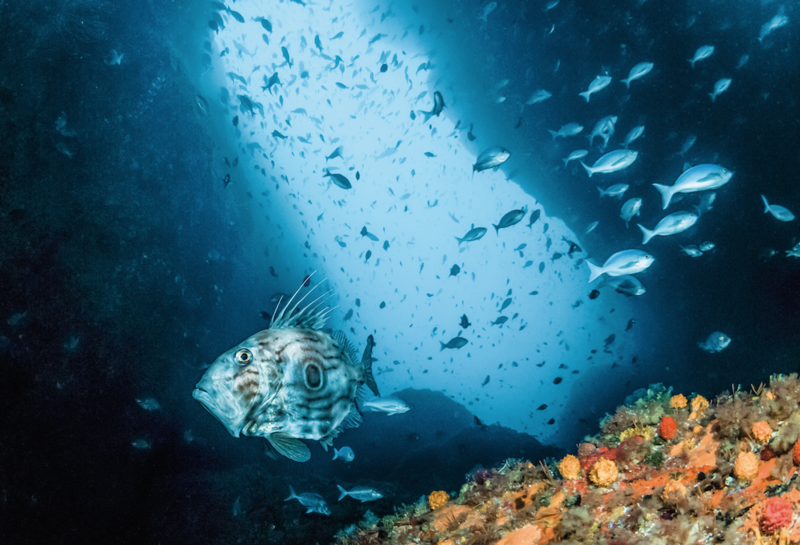 The John Dory image was taken within the Poor Knights Marine Reserves off the North East Coast of the North Island, about 42m down on the south side of the archway. It’s one of my favourite places in the world – despite being deep and darker than many other reefs at the Poor Knights, this is a stunning spot. There are many brightly coloured sponges, ascidians and fish species in and around the archway. The prolific fish life attracts many predators including kingfish, sharks and the subject of this image, the John Dory. At times, there are fierce currents running through the archway but on this day, it was still and beautifully clear. For this shot I used 2 Ikelite Strobes. The Secret Lake is just that. I’d heard rumours and seen a couple of pictures of it. 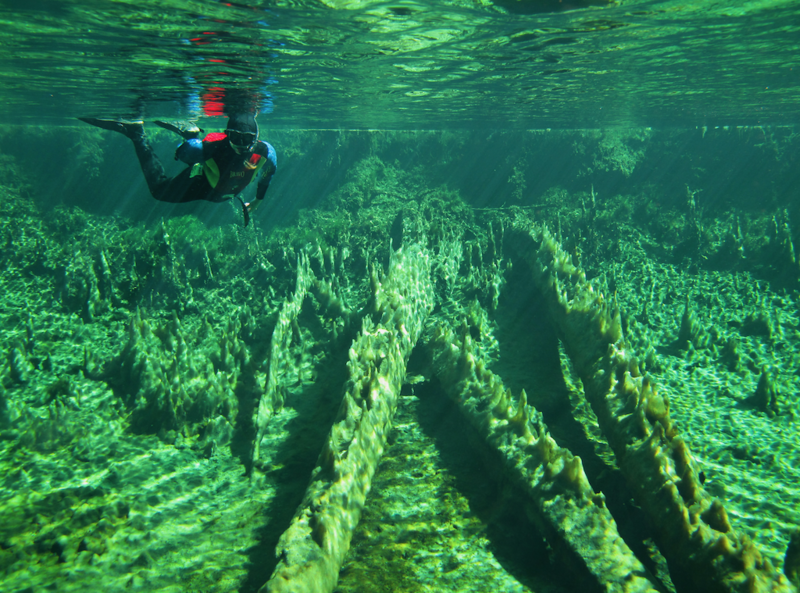 The lake’s location is shrouded in secrecy and mystery, partly to protect this precious spot. After years of searching I finally found it, but I’m not sharing its location with anyone! On a good day visibility is more than 50m. Since finding the Secret Lake I’ve discovered several other crystal clear lakes and springs in New Zealand. I took this shot just using natural light. I photograph a lot of specimens at sea. All the gear has to be solid and you need a lot of light. We take specimen photographs to help identify the animals while they are still fresh and displaying their lifelike colours. Once an animal is put into preservative it loses its colour, so photographing it first is helpful to taxonomists classifying it. The specimen is placed on a grey board or in a water bath and floodlights attached to the table on stand. The camera is mounted between the lights on a sliding stand. As well as the floodlights, I use a Nikkor 60mm macro lens and Nikon ring flash. It can be painstaking and frustratingly slow trying to overcome the technical difficulties but it is all laptop driven, so you adjust the camera settings using the mouse. 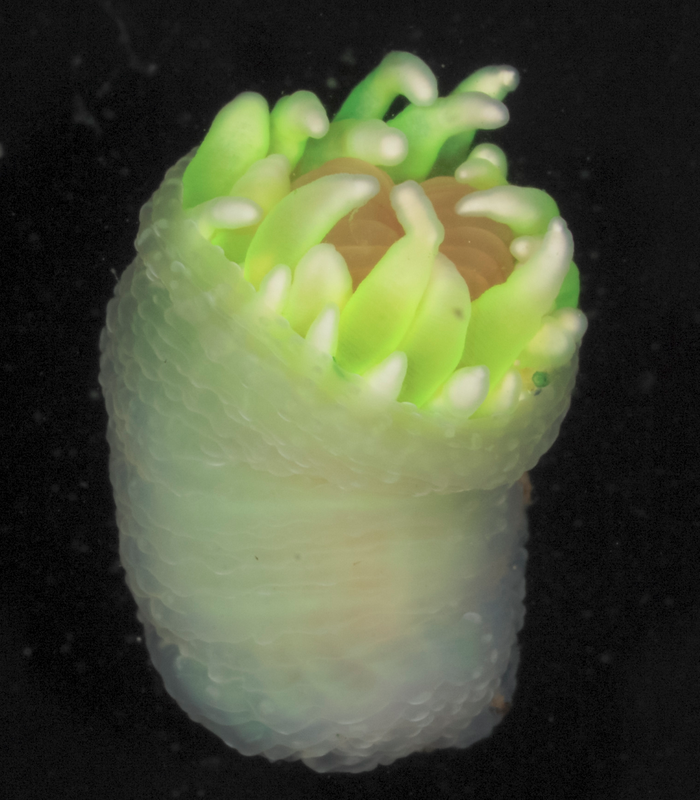 This sea anemone is yet to be classified and may turn out to be new to science. It was found along a relatively shallow section of the Colville Ridge at a depth of 300m towards the Kermadec Islands to the north of New Zealand. 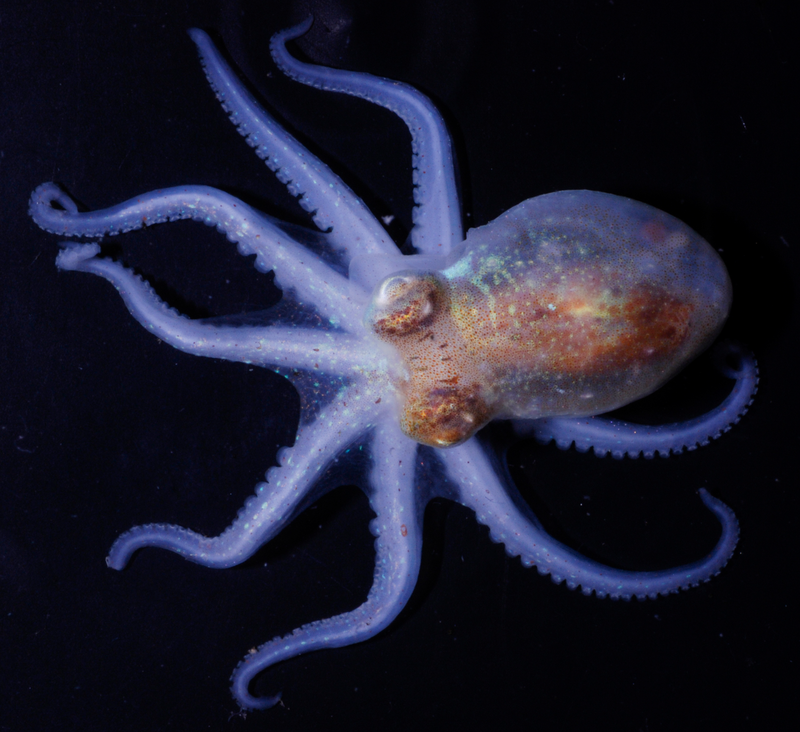 This juvenile octopus is about 4cm long. It was found on the summit of Rumble III seamount, one of the many undersea volcanoes along the Kermadec arc about 300m deep. These guys are masters of camouflage; they use pigment filled sacs each individually controlled by the nervous system that can change colour to suit the environment.Photographing specimens takes patience and it helps if you’re a bit of a perfectionist. The more effort you put in, the better the result. I think it’s important to show the animal some respect and photograph it properly to give an insight into what it looked like on the sea floor. Peter Marriott, specialist diver. Cameras: Nikon D7000 and Nikon D810. 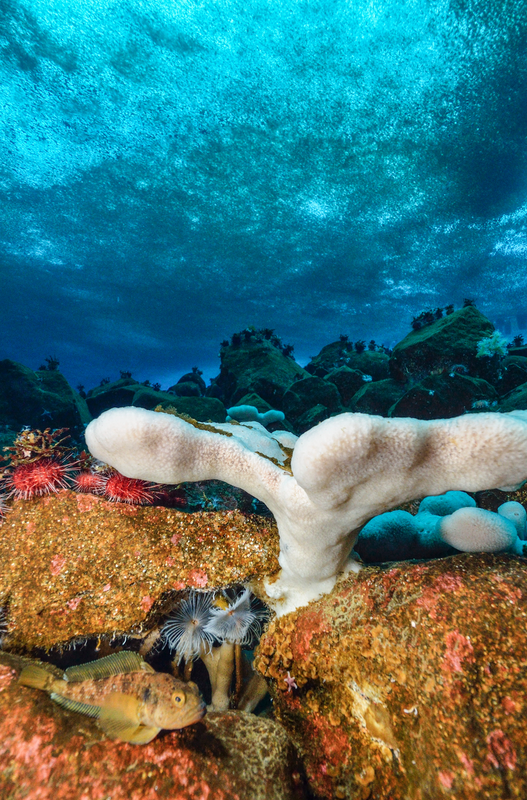 The two underwater photos were taken in Granite Harbour, Antarctica during a series of experiments to measure the effects of ocean acidification under the sea ice. We have to cut a hole through two meters of sea-ice to access this area. 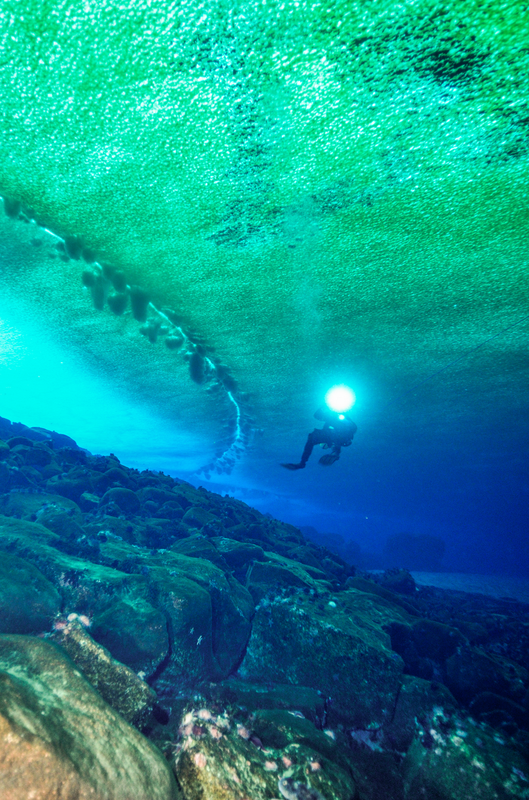 Diving under ice is a challenging environment to work in due to the extremely cold water (-1.9 ⁰C) and solid roof of ice above you. Because of this we dive under very conservative and strict rules. We can only be in the water for up to 40 minutes a time and are limited to two dives per day. You have to stay very calm and relaxed – if you breathe too hard your scuba gear can freeze up and stop working. So setting up technical experiments and taking photographs in a controlled manner can be quite demanding on your diving skills. The photo of the sponge was taken about 25m deep. I use an Ikelite housing with dual Ikelite strobes and a 12-24mm underwater lens. I like the contrasts, it’s almost like looking up into the sky at night. The second underwater image with the diver shows the striking clarity of the water, it is so crystal clear you can literally see for hundreds of metres. The ice above us is about two metres thick and lets through less than one per cent of the light, so it’s like diving in moonlight. You can also see the rich microalgal community growing on the underside of the ice and the tide crack which has brinacles forming along it. I like the fine detail but I most like trying to catch interesting and unusual perspectives, things that people don’t normally see. 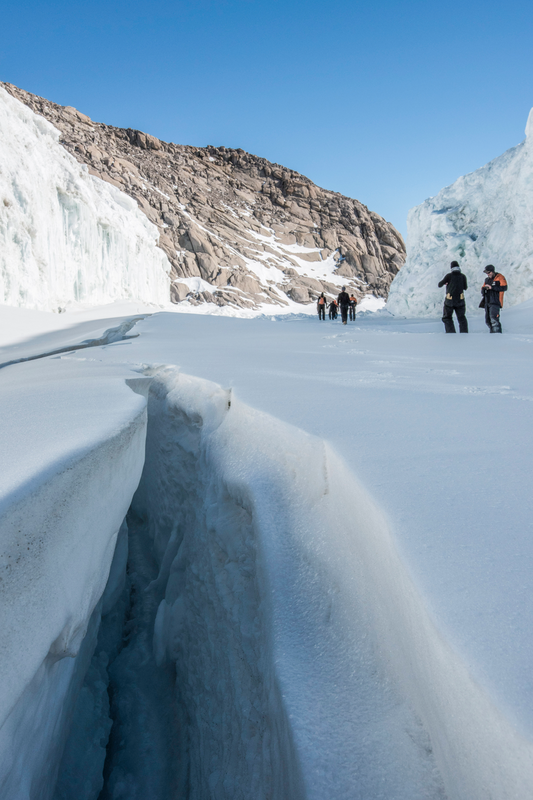 The photo above ground at Antarctica shows a chunk of the Piedmont Glacier on the right which has broken away from the main glacier on the left. My colleagues are standing on one year-old sea ice and in the foreground is a crack formed by the tide flexing the sea ice. It looks very dramatic.